This is the very guide to swap the internal and external SD Card of android phone. Though several guides are already available for this they will assist you to use only on specific device. 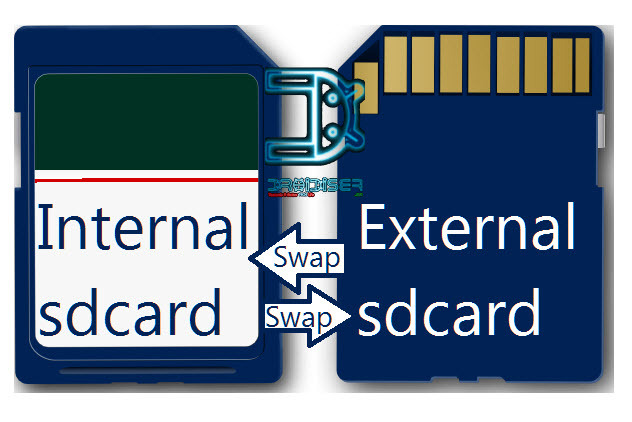 But, using this guide you can swap the internal and external SD Card of any kind of android phone or tablet. Swapping the SD Card will give a lot more breathing space for the devices to get installed. 1. Initially, you need to take a backup of your device via ClockworkMod recovery or any other recovery just to be safe. 2. Then install any file explorer with root permissions. We prefer Root Explorer. 3. After that browse to the location/system/etc and you will find a file named vold.fstab lying there. NOTE : In root explorer, to make any changes to the system files, you need to change the permissions from read only to read and write from the top right. 4. Copy the vold.fstab file to any location on your SD Card. 5. Then Upload the vold.fstab file to any file sharing service like mediafire, devhost or Google Drive. 6. Then download the file from there. Unzip the file using root explorer and copy the new void.fstab file to /system/etc. Change the permissions to rw-r–r– by long pressing on the file. 7. Then reboot your device and go to the storage section on your device. 8. If the internal storage section now reflects the stats of your external (and real) SDcard then copy the data from the real internal SDcard (or the new external SD card) to the real external SD card (or the new internal SD card) to get all your games and apps back to work. NOTE : Suppose, if it didn’t work, delete the vold.fstab file from /system/etc and rename the file vold.fstab.bak back to vold.fstab and reboot your device.